The Holidays can be both stressful and fun. And if you are wanting to buy gifts for your loved ones it can be really stressful if you don’t have the cash to spend on gifts for all of your loved ones. Before I quit my day job over a year ago, this was one thing I stressed about with not having a full time job. I used to worry about how it would all shake out, and what that would look like when it came to giving gifts to family and friends. And the truth is, it doesn’t look any different. In fact, I don’t really stress about it all because I have found ways to save on the holidays and still have the cash to buy gifts! 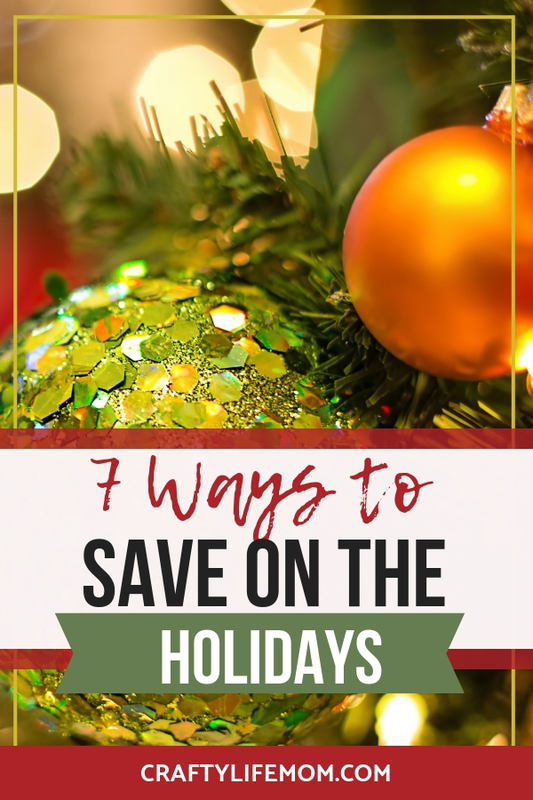 I want to share with you some of my tips on how to save on the holidays and still have a really great Christmas without breaking the bank all while sticking to a budget. This post contains affiliate links for your convenience. There’s no additional cost to your, but in case you want to know where everything is from, I’ve added links for your reference. You can see my full disclosure here! Planning the holidays in advance is super important to saving money. In fact, I personally start planning our Christmas gifts in August. That’s right. August. Just after school begins, and we get back into the school hustle, I start thinking about Christmas. I start with my kids and their toys. Now that they are another school year older, there may be some old toys that they don’t play with. The summertime is a good time to pay attention to if there were any older toys they didn’t use all summer long. Once I indicate which toys this might be, I talk about it with them, and how it might be a good time to donate or pass along those old toys. I then sell them in Facebook Groups, or other marketplaces, and even donate some. The cash from selling old toys starts the cash fund for any new toys or gifts we will spend on them. And, I start the cash stash for Christmas gift buying. In my notepad on my iPhone, I start a Christmas gift list. This list has everyone’s name on my gift giving list that I plan to buy for. This list is also including my kids’ teachers, other friends and maybe for your co-workers or friends. I list out my ideas, and price points for the gift ideas I have for each person. Slowly over the month or so, I will count up all the cash I need to buy gifts, the supplies I need to make any of the gifts, or even buy a gift or two along the way. I stash any pre-bought gifts in my closet. The stashing of cash, materials, and gifts continues until Thanksgiving. And then come Black Friday I have a list, a pocket full of cash, and materials to prepare for making and buy all the gifts. With Black Friday usually the last week of November I find the best deals are that week only. So my personal goal, or game that I play with myself is to finish all the gift buying (materials and actual gifts) for everyone by December 1st! This goal is intentional because I want to enjoy the 25 days leading up to Christmas with decorating, Holiday baking, activities, events, parties and everything else in between. With the gift part out of the way, I can focus on family and friends and of course my favorite, crafts. Typically any handmade gifts get made that first week in December so that they are ready for gift giving! There is always something to make and decorate in the season. So sometimes this doesn’t always go as planned, but I do my best. So make your plan, stick to it as best as you can and shop Black Friday! My second tip is to get Crafty! So the obvious of the point is to make some gifts. There are tons of ways to make cute simple DIY gifts that people actually will love, want and use. If you need ideas, just scour over Pinterest and even Youtube for some really great ideas. If you land on my page, make sure you follow and subscribe! Making gifts, in my opinion, is truly the best. Plus the thought and time spent on a handmade gift is what counts. Even if you aren’t the craftiest person yourself, buying handmade is great too. Typically handmade gifts are the most treasured, and usually almost always are personalized. I know in my online shop, I typically make tons of handmade gifts that are personalized to the receiver. Shop small, and shop handmade. You can also get crafty with the holidays by earning cash back! One way I love this is by using Ebates! Using Ebates you can earn cash back on all of your online purchases. During the Holidays the cashback rates are as high as 10% on stores you already love and use like Amazon and Walmart! The best part is that it is completely free to use and set up. You just shop through the link onto your favorite store, and boom, you get cash back on your purchase! I alone have made over $70 in the past few months just using the app. I know that is not a ton of money, but hey, its FREE MONEY, and I am not turning that down! Neither should you if you already shop online. It really is a no-brainer. Another way to make money shopping is through iBotta. Ibotta pays you to complete tasks, and send your receipt showing the task was complete. They match the items you bought to the offers, and then you get cash back. It is pretty simple and you can sign up, FREE here. One other way is to earn is via Swagbucks. Or use Swagbucks to earn free gift cards! This is pretty amazing and I have heard of other bloggers earning enough gift cards to gift for their entire family’s Christmas gifts. This in itself is pretty amazing. All you have to do is play a few games, or surf the internet, or even take a few minute surveys to earn the Swagbucks that turn into cash or gift cards. I just signed up and already have close to a few hundred Swagbucks. To save money on the Holidays, you don’t always have to spend money to save it. Sometimes the best gifts are the giving of your time. Especially with loved ones. Plan a date and time to spend with someone in the future. You can create a certificate and wrap that up that is redeemable to a movie, or lunch, or even dinner with someone in the future. This way, you can save up the money for that outing that is to be spent at a later date and time. And the person benefits from your company. And if you must still buy something, look for Groupon or coupon deals in your area on experiences that someone can do and redeem on their own. Even spa gift certificates area great because some places offer discounts or additional money on money spent on a gift card. One year, I was getting a pedicure, and the shop I went to gave out a $10 gift card to come back. This was amazing! I could either use on my next appointment or even gift as a gift to someone else without spending any additional money! Another friend of mine does this with her gym. Every year, the local gym offers a Black Friday special on $50 gift cards. Buy One get another $50 gift card for $25. So, she spends $75 but gets $100 in gift cards. She then turns around in January and buys a boot camp or class in full using those gift cards. Now, she used the offer on herself versus a gift for someone. But the idea works the same. My point is that these deals are out there, and you have to be on the lookout for them in order to take advantage. So look for the coupon deals. Even if there are not any deals that you can find. I love the idea of giving an experience. Again, this is a gift card to someplace that involves an activity. Maybe tickets to a local park or zoo. You do not have to buy the whole adventure if it is pricey, say like Disney. But, if you know someone who is saving up to go to a theme park, buy them a gift card to spend while they are there. And if you do not have anything like a major theme park in your town, check out the local bowling alley. Get creative with the experiences local to your town. A great gift is to give your nieces or nephews a bowling game and shoe rental. They can redeem it at any time, and have fun. Plus, their parents will thank you for not cluttering up their home with additional plastic toys! It’s a win-win. My last tip is to just simply save up all year long. A lot of the tips and techniques I already listed mention this same theme of saving up and planning ahead. Christmas comes around once every year, the same day. You know it is coming, so save up for it. I am a huge fan of Dave Ramsey, and as he has said. Christmas is not an emergency. So do not go charging all of your gifts. Going into debt to impress your family and friends is really dumb. And if you are reading this and feel like time is not on your side this year for saving up, then do your best to make or DIY gifts as best you can. No one should make you feel less than for spending less or not actually having a gift for them. And if you didn’t get to save up or bank up the amount of cash you wanted or needed to this year to buy all the gifts on your list, then just cut back. You do not have to buy the latest and greatest gift. And quite frankly, if anyone becomes majorly upset that you didn’t provide them with a gift this year, don’t sweat it. Their heart is not in the right place. We spend the most on our kids and we set a budget for it. If what we want to buy goes over our budget, we don’t get it. Plain and simple. Sure we try to make it happen, but sometimes it doesn’t. And my kids are still spoiled more than they should be. If your kids really want something, then teach to save up for it with the starter amount you can budget for. We are starting to teach our kids to save up for it by themselves. This does two things…. teaches them about money budgeting and on deciding whether or not they really need or want what they “want” today. There’s no greater gift you can give them – which is a lesson on than saving money and budgeting. They may not get it now, but later they will realize how much better off they are by learning this now. The earlier you start the better. Hope you found this helpful! I do my best to provide crafty tips and DIYs to share with you to make your life just a little bit more crafty and fun! Want to Join the Crafty Life Mom Community? If you are new to the Crafty Life Mom community, sign up below to get access to my entire private craft resource library. I share printables for crafting projects and home decor DIYs. Plus I have several SVG cut files that you can use with your Cricut or Silhouette cutting machine and checklists and more! Click the pink box below! 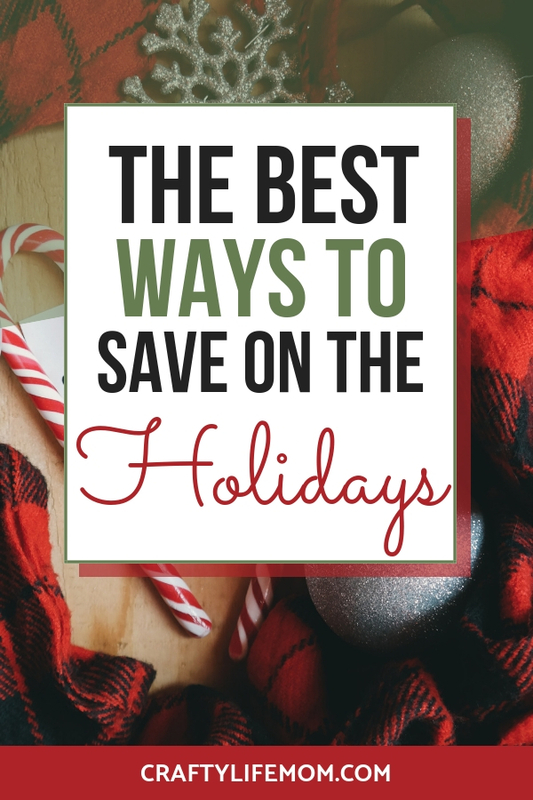 So what are your favorite ways to save on the holidays? Leave a comment below and let me know.